Ideal for anyone wanting to make change for themselves and others. Come along and learn some NLP techniques for making lasting change using swish patterns. With both personal and business applications, swish patterns are a valuable technique to have in your toolkit. An ideal evening of learning and networking. We will send you confirmation and directions when you book. 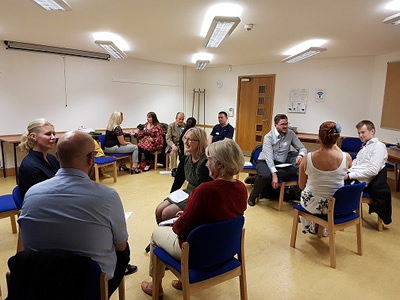 Our NLP for ALL learning sessions are for anyone - particularly if you've an interest in personal development, coaching or NLP - you don't need any previous experience - this is learning for everyone. Above all, it'll be fun - so come along! These events are particularly useful for managers, coaches, teachers, mentors, trainers, parents – in fact anyone and everyone! Come and join us for our friendly evening workshop. There will be demonstrations and group work alongside lots of learning and laughter. to help us with the catering arrangements. We start with some light refreshments at 6:30 and begin the programme at 7. We aim to be finished by around 9:15, be warned, the last people usually leave as we close the room at nearer 10. These are relaxed and friendly evenings of personal development and NLP, everyone is welcome. We always have a lively group of regulars and first timers, with plenty of networking opportunities. If you'd like to learn more about NLP, then this is the ideal event to start with. Our expert trainer, George Cunningham, will be drawing on his extensive NLP and coaching experience, built up over the last 15 years. Each covers an NLP topic or technique with personal development and business applications. So everyone, whatever their background will learn something new and useful. And get some great networking and meet some fascinating new people. Whether you're a complete novice or have years or NLP or coaching experience, we will make you very welcome at these enjoyable interactive workshop sessions. This is a great opportunity for complete beginners, Practitioners and Master Practitioners to meet and practice a couple of really useful NLP techniques in a relaxed atmosphere. It also gives you the chance to come and meet us and see how we deliver our training. The NLP techniques we will teach you, will be really useful, whatever you do. This is a great way of learning from other people, and using each other's real life examples to demonstrate how you can make changes for yourself and others with NLP. Previous evenings have included, Installing and using powerful anchors, Planning for success with NLP, Work/Life Balance - getting it right", "Representational Systems", "Stop, Look and Listen with NLP", "Assertiveness", "Silencing the Worrier Within", "Procrastination - Let's not put it off any longer! ", "Dealing with Negativity", "Dealing with Difficult people", "Stress relief at the push of a button" and "Planning your future". If you have an idea for a topic, Email your suggestion today. 3. You can reserve in advance and pay cash on the night. We do charge £20 for this as a small incentive to book and pay ahead, as we need to know how many are coming for catering and planning purposes. The Quaker Meeting House is on School Lane, next to Bluecoat Chambers and directly behind Primark. It is 5 minutes walk from Central Station. You may be lucky enough to find on street parking in the area, which is free after 6pm, Wood Street or Seel Street are probably your best bet. If you want to be certain of a parking space, Q Park Hanover Street (NOT Liverpool One) is only 5 minutes away. When you leave the car park, exit at Tesco on Hanover Street, cross the road and head right, passing BBC Radio Merseyside on your left. Turn left into school lane, the Quaker Meeting House is around 50 yards ahead on your left. The reception will direct you to The Institute Room, our venue for the evening. We're always open to suggestions for the title of the next event. Do you want something for use in business, personal development or therapy. Email me your ideas and we'll put the best suggestions to the vote. Call us now on 0151 931 5184 or email us your enquiry.